and also designing and developing various devices. This is “Bumblebee 20”, a fully automated transforming robot of TRANSFORMERS “Bumblebee”. TOMY released “Bumblebee 20” at the International Tokyo Toy Show 2015. 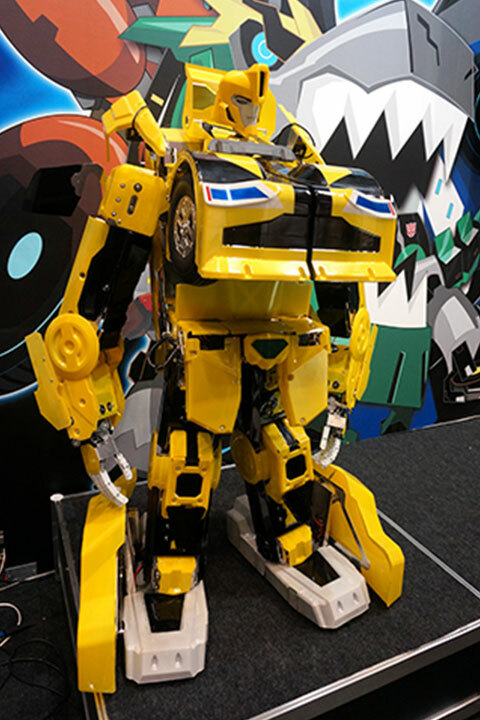 Length: 26.5cm Weight: 0.75kg Actuators: 21 Servomotors It is named as “Bumblebee 20” because its size is as 1/20 of the original Bunblebee. It can transform between humanoid and vehicle form as quickly, in just a few seconds. BRAVE ROBOTICS developed the hardware and Asratec took part in the software developlent. V-Sido OS is adopted as the control system. “Bumblebee Quarter” is a fully automated transforming robot of TRANSFORMERS “Bumblebee”. It is a quarter of the original size of Bumblebee. It can transform between humanoid and vehicle form. V-Sido OS is adopted as the control system. Using V-Sido OS, bipedal walking is realized. Running on tires is also possible when in vehicle mode. The robot is controlled using PC and you can move the robot freely using a mouse or a game controller.